If your wedding Dress is very netted out with lots of layers and you want to keep it for years to come, it will need to be kept in an extra large box to avoid excessive creasing. How do I know which size Wedding Dress Box to choose? Lay your dress on a bed, fold the bodice over the skirt and tuck in the sides. Press down gently and measure the dimensions of your dress, particularly the height if choosing between the Standard and the Extra Large. For the medium you will need to fold the dress twice. Once at thigh level and again above the waist. All of our boxes are hand made from PH neutral card and have acid free tissue. 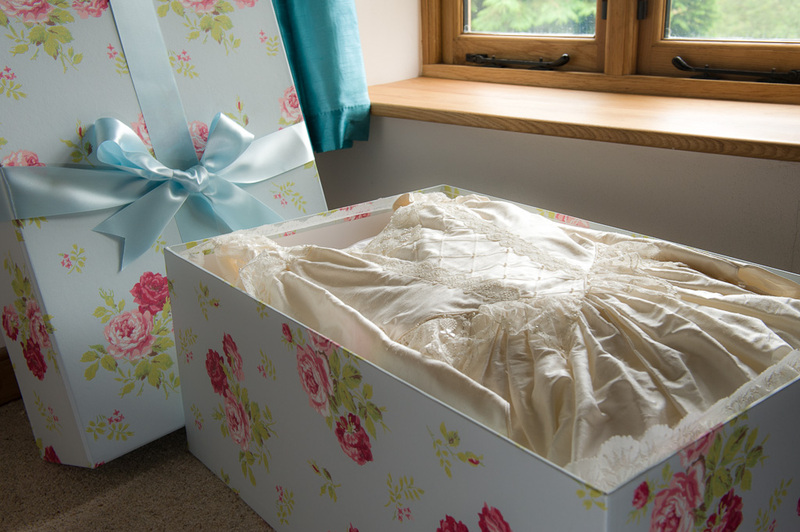 Our wedding dress boxes are unlike any others you will find. They are stunning. The papers and board are extremely durable and designed to last a lifetime. Other boxes can be flimsy, yet still just as expensive! You will find our boxes unique, stunningly beautiful and excellent value for money.